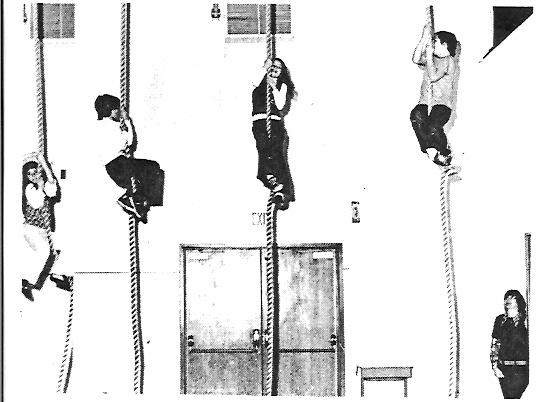 In January, 1974 new gym ropes were installed at Van Zant School. Evesham Township News covered this improvement with this photo showing students, (l-r) Collen McCay, Charlie Carabassi, Gayle Shubert, Jeff Giglio, demonstarting the use of the ropes under the watchful eye of PE teacher Janet Halasek. 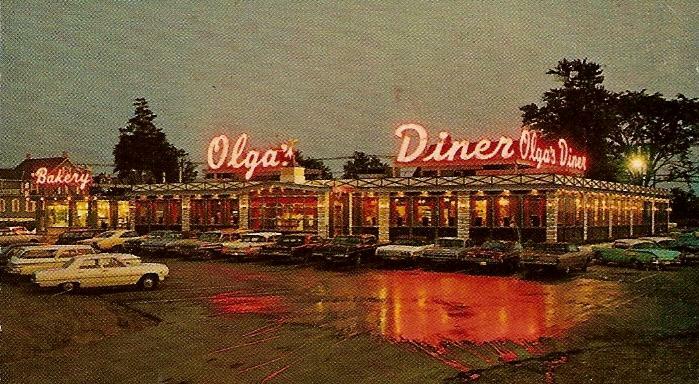 Here we see Olga's Diner the way it looked when it opened at the Marlton Circle in 1960. This smaller unit and seperate Bakery was replaced in 1965 with the larger one shown below, a 400 seat Fodero-built diner which remained in operation until October, 2008. The site is up for sale and it is reported a developer is interested in building an office building or shopping center here. It was once possible to see the bright neon Olga's sign as far as Van Zant School at night and cloudy days. The exposed neon tubes were later covered with red plastic giving the sign a softer glow. These Van Zant students were inpatient to begin with things on September 9, 1971, the start of the 1971-72 school year. Shown in this photo published in the Evesham Township News was (l. to r.) Patrick Cornelious, 8; Lisa DeRosa, 9; Christina Walszak, 5; Allison Walczak, 8; and Jeff Keen, 7. Note the orchard next to the school. 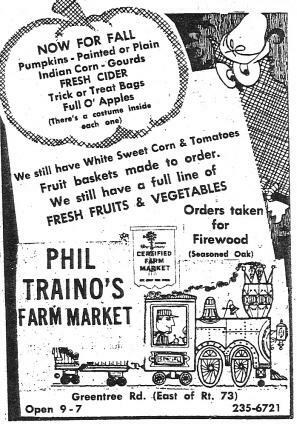 October, 1972 ad for Phil Traino's Farm Market which was located on Greentree Road between Route 73 and Maple Avenue. Opened in 1971, this market was an expansion of a wholesale produce business started by Rosario Traino in 1906, later run by his son Joseph and finally Joseph's son Phil who started the retail stand. 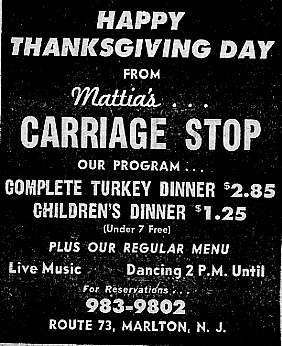 A November, 1970 ad for Mattia's Carriage Stop on Route 73 north of Baker Blvd. This site is now Bone Fish Restaurant and Flemming's Steak House. Mattia's was later known as Gallagher's Carriage Stop. 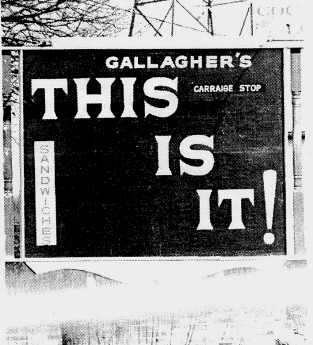 It was when it was owned by Gallagher that there was a controversy in 1975 over the road sign in front of the business. The tavern had painted, described in The Evesham News as "the back view of a horse which had previously defecated and a bird adjoining the defecation". The sign remained this way for a couple months while offended local residents brought it up before Township Council which led to a visit by the Mayor to request the sign be removed. Soon the Alcohol Beverage Control got involved and threatened to suspend or revoke Gallagher's liquor license. Gallagher then changed the sign to show just the outline of the horse looking over his shoulder but the ABC wasn't satisified with this so the image was completely removed. The Carriage Stop sign after the offending picture was painted over in April, 1975. 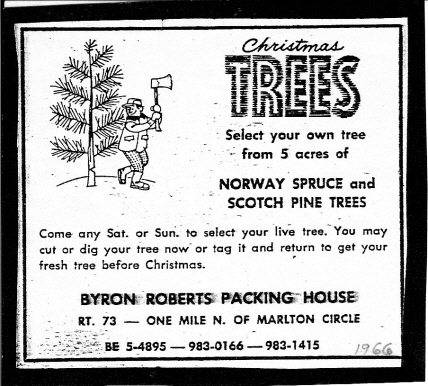 A 1966 ad for Christmas Trees at Robert's farm. Selecting a tree here was a tradition for many Woodstream residents. The Roberts had two Christmas tree plantations - a large one at the northern end of Woodstream at the end of Brandywine Drive and a smaller one on Greentree Road behind the Roberts Packing House and Farm Market. 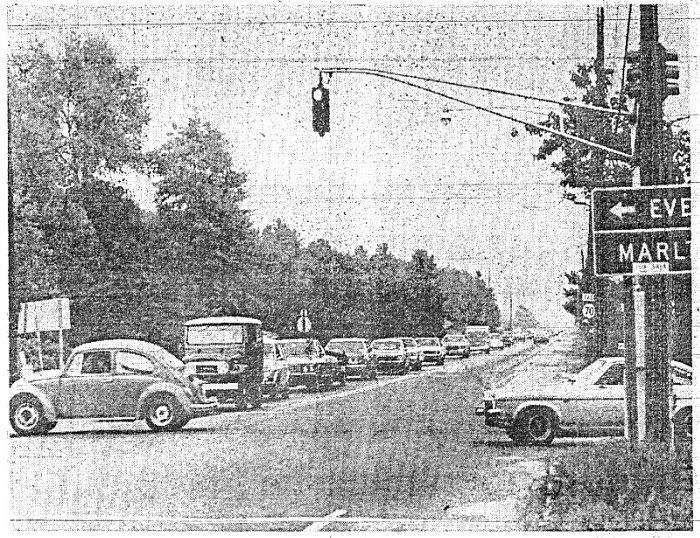 August, 1975 photo from the Courier-Post showing Route 70 when it was a two-lane highway. This was taken at Maple Avenue looking east toward Locust Avenue.